When the world has been brown for months, the first emergence of green is a wonderful thing. Skunk cabbage has been unfurling for several weeks now and is a most welcome sight along woodland streams and wetlands. In late winter, it sends up a maroon-striped spadix, which encloses its unpleasant smelling flower, and then in early spring it unrolls bright green leaves. I recently spent a pleasant afternoon sketching on the edge of a wooded steam, enjoying dappled sun and birdsong, and feeling grateful for this one beautiful color. Option 1: Start with a couple of quick thumbnail sketches. These will help you figure out whether you like your subject enough to devote time to it and whether you think you can tackle it in the time you have. Thumbnails will also help you consider different approaches to page layout. They can help you map out where the lights, mid-tones, and darks are too, which will give you a road map for the full page version. Option 2: Just begin! Rather than thinking you have to figure out everything before you start, consider that your sketching journey can begin with a single step. Make a mark. Make another. Keep looking, keep going until you feel satisfied with the page. Option 3: Be thoughtful. Consider what drew you to sketch this particular subject. Think about it for a minute- was it the color? The light? The scene or object? The story? Your experience? When you have an answer, you’ll have a better idea of what to emphasize and how you want to approach the page. 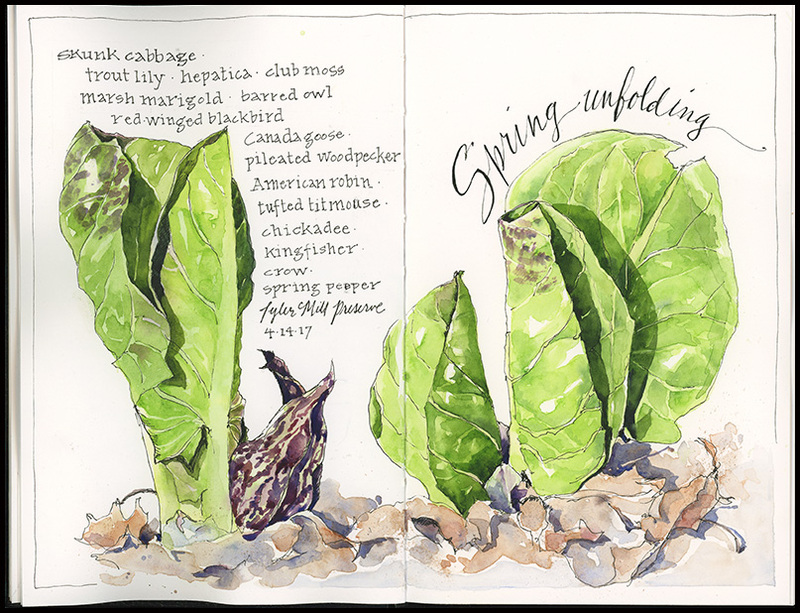 This entry was posted in Journal, Watercolor and tagged natural history illustration, nature, sketchbook, skunk cabbage, spring, watercolor sketch by Jean Mackay / Drawn In. Bookmark the permalink. Very useful sketching tips – thank you! Yes…so do more advanced artists! Biting off what you can chew can help to build confidence and skill. Thank you! Such obvious but always forgotten wisdom in option 1 and 3. Ann ~~~~~~~~~~~~~~~ Sent from Ann Patterson. Note: email sent to my primary address, ann.patterson@comcast.net is forwarded to annapat@icloud.com. So you may use either address. I have to remind myself of the obvious sometimes. Glad it was helpful for you too. Your sketch very well describes its appearance. Thank you you for sharing. I’d love to join your sketching group that will be painting on the island in Maine. The Maine coast has all its own beauty, so serene and lovely but I just returned from traveling in Europe and need to keep my walking feet at home for a while. Thanks, yes, isn’t skunk cabbage great?! Think about the process in stages when I can. Time to take a second look! I’m drawn to the unfurling and to things that twine…makes for interesting drawing. This is so beautiful, it relaxes me just looking at it. Thanks Teri– so nice to hear! Those are excellent tips and they can easily apply to other arts as well. They are basic things we often forget. I think they are most useful when faced with complicated subjects or when there are a lot of choices about what to focus on. I like the words, and how they are laid out on the page. Thanks Lisa– I always enjoy doing that part. This is all such great advice, especially just start. That one line on the page can open the floodgates. I released myself from my theme – which was making picking a subject hard and not very inspiring – and now I’m feeling inspired by everything. Your sketch is beautiful. You have such a talent for capturing the lights and darks. You are really organised …… helpful advice. Composition is where I struggle .. Your paintings don’t look like you struggle with composition! But it is sort of like a puzzle– the pieces have to fall into place for things to look right.